A fire can start at just about any time and it can cause extensive damage in a home or building, especially if you are caught off guard. 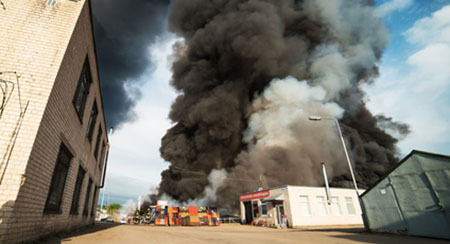 The fire can significantly damage building materials and furnishings with charring but it is the smoke and corrosive byproducts that often cause the most damage. Soot from the smoke can settle in areas of the home that the fire did not reach to cause tarnishing and etching on affected surfaces and synthetic materials give off corrosive byproducts when burned that can also cause additional damage after a fire has been extinguished. ServiceMaster Disaster Restoration and Recovery provides fire and smoke damage restoration services in Palo Alto, CA to help repair and restore fire damaged homes and businesses. We will arrive quickly to prevent additional damage and begin the restoration before any of the damage becomes permanent. 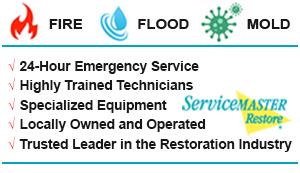 The ServiceMaster DRR technicians that arrive on the scene of a fire are licensed and insured to restore large losses from a fire in commercial and residential settings using the most advanced cleaning products and equipment available. We respond within 1-2 hours of your call to make sure we limit the spread of the damage and treat surfaces with tarnishing and soot damage before the damage becomes permanent. Each of our technicians has been highly trained to provide quality fire and smoke damage restoration in any situation and our cleaning products can effectively remove etching and tarnishing from delicate household surfaces including porcelain, brass, chrome, aluminum, stainless steel, and carpeting. Brush off furniture, drapes, and carpeting to remove loose soot. Put old linens or towels over your carpeting or flooring to protect it from soot. Dispose of any open food containers because of the risk of contamination. Thoroughly wash the inside of your refrigerator if the power goes out and prop the door open to dry. Submit smoke damaged clothing and other fabric to us for restoration dry cleaning. Wipe the soot damage from porcelain, chrome, and Formica surfaces. Brush off your house plants to remove soot. Replace the filter in your furnace if your home is heated with forced hot air. Put a damp cheesecloth over each return and supply register to remove soot from the air. If the outside temperature is over 60 degrees, open up all doors and windows to help remove any odors. You should not try to clean soot damage because improper cleaning methods can make the damage worse. Save carpeting and upholstery that has been damaged by soot for our professionals. Hold off using any electrical appliances until they have been inspected and approved for use. Do not use ceiling fixtures if the ceiling is wet because this could cause a short circuit. Oils from your hand can penetrate certain building materials such as wood and drywall so do not touch soot damaged walls. Contact ServiceMaster DRR immediately for fire and smoke damage restoration. 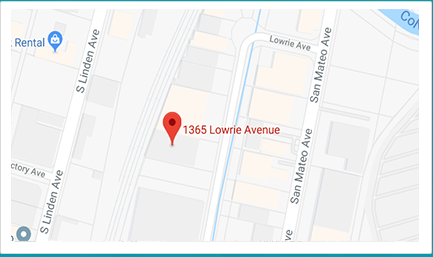 The damage is still spreading even if the fire has been put out so make sure you contact ServiceMaster DRR immediately if your home or business in Palo Alto, CA has been affected by a fire. We will arrive within just an hour or two of your call to start limiting the spread of the damage. Our phone lines are open 24 hours a day at (800) 439-8833 to respond to fire damage emergencies in Palo Alto, CA.